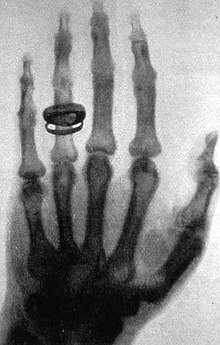 X-rays are a type of invisible light beyond ultra-violet. They pass through skin and tissue, but not bone, making it useful in medicine. X-rays are a type of radiation. When John broke his arm, he had an X-ray taken. Something that is X-ray is something to do with X-rays. The airport had an X-ray scanner. You can use a capital X or a small x when writing this word. An X-ray is the same as an x-ray. This page was last edited on 23 April 2017, at 09:48.